The ceramics probably consisted of simple concave vessels that were likely used for cooking food, said Ofer Bar-Yosef, an archaeologist at Harvard and an author of the study, which appears in the journal Science. The invention of pottery introduced fundamental shifts in human subsistence practices and sociosymbolic behaviors. Here, we describe the dating of the early pottery from Xianrendong Cave, Jiangxi Province, China, and the micromorphology of the stratigraphic contexts of the pottery sherds and radiocarbon samples. The radiocarbon ages of the archaeological contexts of the earliest sherds are 20,000 to 19,000 calendar years before the present, 2000 to 3000 years older than other pottery found in East Asia and elsewhere. The occupations in the cave demonstrate that pottery was produced by mobile foragers who hunted and gathered during the Late Glacial Maximum. These vessels may have served as cooking devices. The early date shows that pottery was first made and used 10 millennia or more before the emergence of agriculture. This appears quite consistent with my model of mostly recent origins of European populations from a West Asian womb of nations. I can't wait to get my hands on this new data. 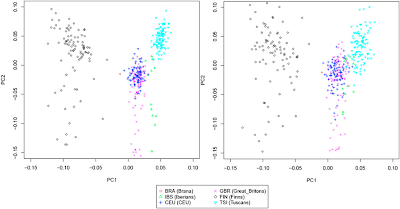 In the genomic analysis, it is interesting to see that the La Braña individuals do not cluster with modern populations from Southern Europe, including those from the Iberian Peninsula. The first PC separates a north-south distribution, whereas the second follows a general east-west pattern in modern Europeans. 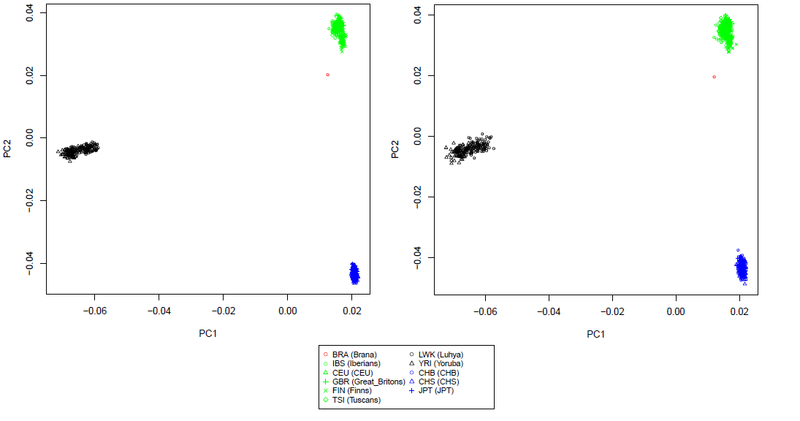 The position of La Braña individuals in the 1000 Genomes Project data and the 1KGPomnichip PCAs suggests that the uniform Mesolithic substrate could be related to modern Northern European populations but may represent a gene pool that is no longer present in contemporary Southern European populations. In the latter PCA, where the origin of each Iberian sample is known, it is possible to see that the Mesolithic specimens are not related to modern Basques, contrary to what has been previously suggested in some recent studies . 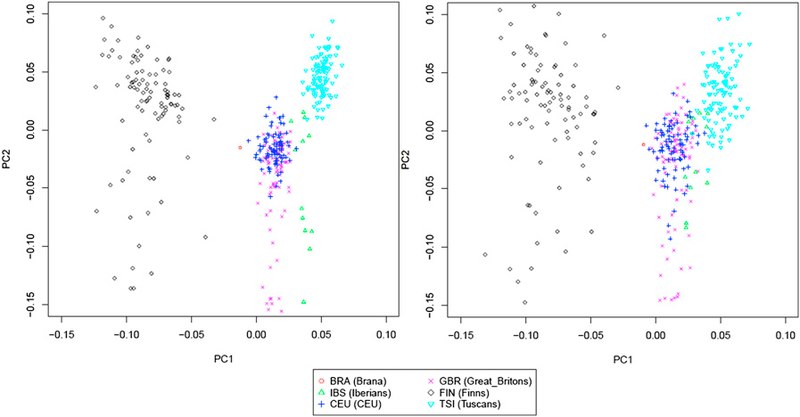 The global PCA of the two individuals shows a clear shift relative to extant Europeans. With respect to the Asian- and African- shift of West Eurasian populations, I note that northern Europeans (and Basques) are less African-shifted than southern Europeans, and, at the same time they are more Asian-shifted: the 16 least Asian-shifted populations have a coastline in the Mediterranean (excluding the Portuguese), while the 16 least African-shifted populations do not (excluding the French). 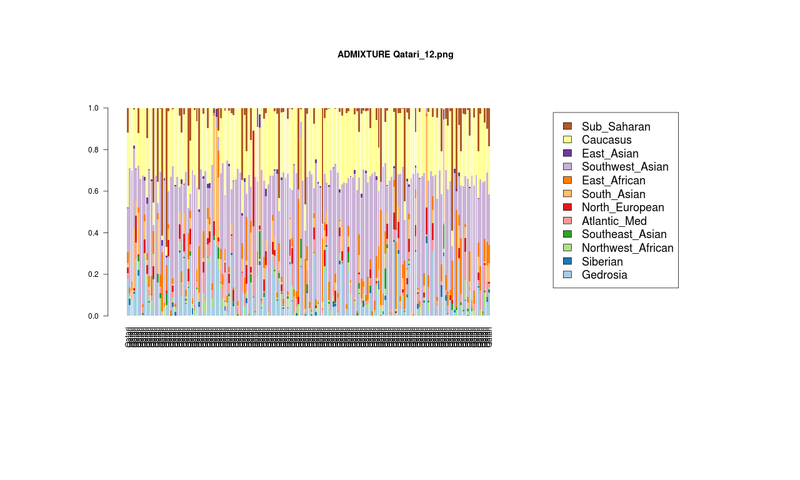 UPDATE: Due to the small number of SNPs, I pooled the two Mesolithic individuals into a single composite one; the K7b admixture proportions are: 9.3% African and 90.7% Atlantic_Baltic, which appears consistent with the position of the individuals in the European PCA plot. 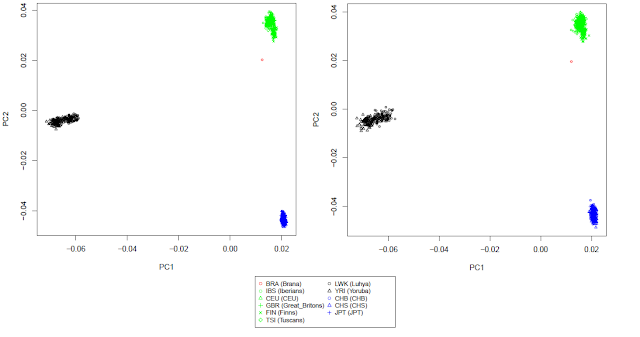 The sub-1,000 SNPs in common with the K7b do not give me a lot of confidence in the minority element, but, in any case, the high Atlantic_Baltic figure is what I would expect and appears consistent with the similarly high Atlantic_Baltic figure of the Swedish Neolithic hunter-gatherers. UPDATE II: Using the K12b, the results are: 45% Atlantic_Med, 41.6% North_European, 10.3% East_African, 1% Sub_Saharan. UPDATE III: In terms of the euro7 calculator, the results are: 89.6% Northwestern, 1.6% Southeastern, and 8.7% Far_Asian. Summary The genetic background of the European Mesolithic and the extent of population replacement during the Neolithic [1,2,3,4,5,6,7,8,9,10] is poorly understood, both due to the scarcity of human remains from that period [11,12,13,14,15,16,17,18] and the inherent methodological difficulties of ancient DNA research. However, advances in sequencing technologies are both increasing data yields and providing supporting evidence for data authenticity, such as nucleotide misincorporation patterns [19,20,21,22]. We use these methods to characterize both the mitochondrial DNA genome and generate shotgun genomic data from two exceptionally well-preserved 7,000-year-old Mesolithic individuals from La Braña-Arintero site in León (Northwestern Spain) . The mitochondria of both individuals are assigned to U5b2c1, a haplotype common among the small number of other previously studied Mesolithic individuals from Northern and Central Europe. This suggests a remarkable genetic uniformity and little phylogeographic structure over a large geographic area of the pre-Neolithic populations. Using Approximate Bayesian Computation, a model of genetic continuity from Mesolithic to Neolithic populations is poorly supported. Furthermore, analyses of 1.34% and 0.53% of their nuclear genomes, containing about 50,000 and 20,000 ancestry informative SNPs, respectively, show that these two Mesolithic individuals are not related to current populations from either the Iberian Peninsula or Southern Europe. If you're in need of a good belly laugh, I'm sure you'll find something in the Mapping Stereotypes site to suit you. The BEAN project has been on my radar for a while now, and it's great that it seems to be alive and well. Hopefully it won't be too long until it starts producing results. "BEAN – Bridging the European and Anatolian Neolithic" is the name of a new multinational educational network which has received funding from the European Commission for the next four years. It is classified as a so-called Initial Training Network (ITN) in the EU Marie Curie Actions program, which allows young scientists early access to research activity at top international institutions. A basic requirement for funding is that the researchers involved leave their home country and conduct their research in another European country. The BEAN Network consists of several European partners in England, Switzerland, France, Germany, Serbia, and Turkey, and has set itself the goal of enhancing the skills of a new generation of researchers in the subjects of anthropology, pre-history, population genetics, computer modeling, and demography. Many different disciplines are participating in the initiative. An important associate partner on the German side is the German Federal Statistical Office in Wiesbaden. The common focus of the project partners centers around questions associated with the origin of first farmer settlements, which were established some 8,000 years ago in West Anatolia and the Balkans. Where did they come from? Were they migrants from the Middle East? Are they our ancestors? Anthropologists at Johannes Gutenberg University Mainz (JGU) have been meticulous in their preparation of the project over the last years and have entered into various cooperations to underpin it. Seven research institutions and two commercial companies are now working together on the BEAN project. Two leading researchers serve the network in an advisory capacity. These are archaeologist Ian Hodder from Stanford, who established his reputation with his excavations in Catal Höyük, and Hermann Parzinger, President of the Prussian Cultural History Foundation, who spent many years excavating and researching in European Turkey. As of July 2012, doctoral candidate Zuzana Fajkošová, who completed her undergraduate studies at Masaryk University in Brno and at Charles University in Prague in the Czech Republic, will be the first of two BEAN researchers to start work at JGU's Institute of Anthropology and in the new palaeogenetic laboratory, which is currently in the final stages of construction on the edges of the university's Botanic Garden. She will analyze DNA from the bones of the last hunter-gatherers and the first settled farmers in the region between West Anatolia and the Balkans using the new cutting-edge technology of Next Generation Sequencing (NGS). Together with her colleagues in Dublin, London, and Geneva, she will use the genomic data to compile a model for the settlement of Europe. "It is both a great honor and a huge opportunity for me that I can work together with such renowned researchers. I'm looking forward to Mainz, the university and the institute's new building," comments Fajkošová, who turned down a number of other offers in order to work at JGU. "A major factor leading to her appointment was the fact that besides mastering biomolecular techniques she also has good programming skills,” explains Professor Dr. Joachim Burger, the Network Coordinator. "A few years ago we more or less founded the discipline of Neolithic Palaeogenetics single-handedly. However, undertaking genomic projects is possible only with the help of international colleagues. That is why we are so pleased that such networks give us and our colleagues the chance to train young research talents." Besides academic training, the young researchers will be able to do practical work for the two commercial companies within the network and thereby gain work experience in a non-university environment. "This is important as not all of the candidates will opt for a pure research career," explains Karola Kirsanow, who moved from Harvard to Mainz last year and now administrates the network together with Burger. "Our young colleagues have to attend many workshops, courses, and internships, most of them abroad. While this makes for a very tough program, we believe that it significantly enhances the quality of the training and similarly enhances candidates' career prospects." The recent publication of Omberg et al. (2012) has reminded me of the data of Henn et al. (2012) on Qatar which I don't believe I've used yet. I used the K12b calculator on ~20,000 SNPs that are common between it and the Affymetrix chip used. On the basis of the above, I conclude that there are several different groups represented in the Qatari population. I have absolutely no knowledge about the Qatari population, so it would be interesting to see if readers find correspondences between these and known social divisions in Qatar. For example, I could wager that #5 which is a "Southwest Asian"+"Caucasus" mix represents a pure Arabian group with little outside influences. #1 and #2 are also Arab-like but with various degrees of admixture. #3 appears to include substantial African descendants and #4 a clear Iranian signal due to the high "Gedrosia" component. Of interest is that the "African" group #3 also scores high in the "South Asian" component. This sounds amazing, hopefully I can give it a try before not too long. Software link. Here, we present a study of genome-wide admixture in this region, using 156 genotyped individuals from Qatar, a country located at the crossroads of these migration patterns. Since haplotypes of these individuals could have originated from many different populations across the world, we have developed a machine learning method "SupportMix" to infer loci-specific genomic ancestry when simultaneously analyzing many possible ancestral populations. Simulations show that SupportMix is not only more accurate than other popular admixture discovery tools but is the first admixture inference method that can efficiently scale for simultaneous analysis of 50-100 putative ancestral populations while being independent of prior demographic information. By simultaneously using the 55 world populations from the Human Genome Diversity Panel, SupportMix was able to extract the fine-scale ancestry of the Qatar population, providing many new observations concerning the ancestry of the region. For example, as well as recapitulating the three major sub-populations in Qatar, composed of mainly Arabic, Persian, and African ancestry, SupportMix additionally identifies the specific ancestry of the Persian group to populations sampled in Greater Persia rather than from China and the ancestry of the African group to sub-Saharan origin and not Southern African Bantu origin as previously thought. Some abstracts of interest from SMBE 2012. Part II will follow. There has been recent excitement and debate about the details of human demographic history, involving gene flow that has occurred between populations as well as the extent and timing of bottlenecks and periods of population growth. Much of the debate concerns the timing of past admixture events; for example, whether Neanderthals exchanged genetic material with the ancestors of non-Africans before before or after they left Africa. Here, we present a method for using sequence data to jointly estimate the timing and magnitude of past genetic exchanges, along with population divergence times and changes in effective population size. To achieve this, we look at the length distribution of regions that are shared identical by state (IBS) and maximize an analytic composite likelihood that we derive from the sequentially Markov coalescent (SMC). Recent gene flow between populations leaves behind long tracts of identity by descent (IBD), and these tracts give our method its power by influencing the distribution of shared IBS tracts. However, since IBS tracts are directly observable, we do not need to infer the precise locations of IBD tracts. In this way, we can accurately estimate admixture times for relatively ancient events where admixture mapping is not possible, and in simulated data we show excellent power to characterize admixture pulses that occurred 100 to several hundred generations ago. When we study the IBS tracts shared between and within the populations sequenced by the 1000 Genomes consortium, we find evidence that there was no significant gene flow between Europeans and Asians within the past few hundred generations. It also looks unlikely that the Yorubans of Nigeria interbred with Europeans or Asians in a population-specific way, though there may have been admixture between Africans and an ancestral non-African population. Range expansions and colonizations are ubiquitous in many species and are studied from many different perspectives in e.g. anthropology, biogeography and invasion biology. It has been well established that these colonization events lead to a loss of genetic diversity and that in many cases it is possible to infer the history of a species' range from present-day genetic data. Previous approaches were mainly based on within-population measures of diversity such as heterozygosity, which then have been compared between populations. However, it is also well established that these statistics are susceptible to confounding demographic factors such as unequal subpopulation sizes or population size changes. In this study, we propose a novel method using data from multiple populations to infer a population's history. Our approach is based on a statistic that detects asymmetries in the 2D-allele frequency spectrum that occur when one population consists mostly of offspring of another population, as we expect in an expanding population. We show that our statistic is able to detect the direction of an expansion using data from multiple populations. Using simulations, we further show that our statistic is generally more powerful than previous approaches and that it is robust to a wide array of confounding demographic factors. We further illustrate the use of our statistic on several data sets for humans, Drosophila and Neurospora and show that we are both able to detect global patterns of colonization and fine-scale population structure. About 11,000 years ago, a change in human lifestyle took place in the territories of present-day western Iran, the Levant region and south-east Anatolia, which is characterised particularly by four factors: the people founded permanent settlements with buildings for various functions; plants such as Einkorn and beans were cultivated; goats, sheep, pigs and cattle were domesticated; a new kind of culture evolved, that became conspicuous with the appearance of a new material culture including ground stone tools and later, pottery products. The transition from the partly nomadic huntergatherer subsistence strategy to a settled lifestyle based on food production is also known as the “Neolithic Revolution”. About 8,500 years ago, the Neolithic culture spread to the southeast of Europe and later expanded episodically across central and northern Europe. The extent to which this movement of a farming culture was accompanied by a movement of people, as opposed to just a spread of ideas and skills, has been a subject of considerable debate and dispute over the last 100 years. Population genetic computer simulations of genetic data from ancient human remains, based on coalescent theory have shown that the early Neolithic farmers could not have been descended just from the later hunter-gatherers of central Europe (Bramanti et al. 2009). As the hunter-gatherers had already been settled in Central Europe since the retreat of the glaciers 20 kya, Neolithic famers must have migrated into this area. There is good evidence of cultural contact between hunter-gatherers and early farmers in central Europe. Whether the exchange of hunting tools also led also to the exchange of men is still not clear, as Y-chromosomal DNA has not yet been studied systematically in ancient human remains. Moreover, ancient DNA evidence is now emerging that other regions don/t follow the patterns of population discontinuity observed in Central Europe. While the overall results support a model of demic diffusion of farmers from southeastern Europe, or even further East, in to Central Europe, it is very likely that modern populations in most parts of Europe were formed by varying degrees of admixture between incoming farmers and indigenous hunter-gatherers. Analyses of the appropriate neutral and phenotypically informative markers using next generation sequencing technologies will provide more information on this in the near future. Extracting genetic information from ancient material has for long been hampered by numerous difficulties since its first steps some two decades ago, but in the last few years, many of these problems have been solved and the use of ancient DNA (aDNA) is now beginning to show its full potential. We will likely see a wealth of genomic data from ancient populations, but the statistical properties of time-structured genetic samples are considerably less explored than population genetic patterns arising from spatial structure. Using simulations, we explore and highlight features of temporal structure and spatial structure, such as an 'isolation-by-time' effect that is similar to isolation-by-distance. Using model- and simulation-based approaches, we can now make novel inferences about demographic and evolutionary questions from time serial data. We will discuss examples from the long standing debate about the introduction of farming in Europe and question about archaic ancestry in East Asia using paleogenomic data. The geographical and temporal origin of the dog is controversial. Genetic data suggest a domestication event in Asia or the Middle East about 15,000 - 30,000 years ago, whereas the oldest dog-like fossils are found in Europe dating to over 30 thousand years ago. We genetically analyzed the remains of 14 prehistoric wolves and dogs including some of the oldest dog remains described from the New and Old World. Utilizing array based DNA capture techniques coupled with Illumina double indexed sequencing, we targeted a total of ~750,000 nucleotides in each of the ancient canids and additional 20 contemporary wolves from North America and Eurasia. The sequence information comprised the complete mitochondrial genome, 3,000 SNPs previously identified as highly informative for differentiating dogs from wolves, exonic sequences from 62 potential domestication genes and ~150,000 nucleotides of non-coding regions spread throughout the genome. Initial analyses reveal that we have successfully captured and sequenced the complete mitochondrial genome with high coverage as wells as a substantial number of autosomal fragments from ten prehistoric canids and all contemporary wolves. Phylogenetic analysis combining the complete mitochondrial genomes of the prehistoric canids with those of a large collection of modern dogs and wolves result in a statistically well supported tree. While some haplotypes cluster within modern dogs or wolves, others show a basal placement in the phylogeny. The latter finding might support a previous notion that an aberrant lineage of dog-like canids might have existed throughout the northern hemisphere during the late Pleistocene and became globally extinct during the last 20,000 years. We will test this hypothesis by investigating the autosomal loci and employ sophisticated phylogenetic analyses, demographic modeling and selection scans to better understand the influence of early human society and artificial selection on the canine genome. A substantial proportion of humans are "admixed", in the sense that their recent ancestors belong to statistically distinct groups. This needs to be accounted for if unbiased inference and associations are to be performed. We present a diversity of methods for the analysis of whole-genome sequence data from admixed individuals, and apply them to 50 genomes sequenced by Complete Genomics, including 4 Mexican-Americans, 4 African-Americans and 2 individuals from Puerto Rico, together with SNP genotype data from hundreds of additional samples. Many methods have been presented recently to infer the population of origin of specific loci along the genomes of admixed individuals, leading to inferred mosaics of ancestry. We first propose a simple Markov model that relates the time-dependent migration history to the inferred patterns of local ancestry. We use this framework to infer the timing of admixture and to differentiate between punctual and continuous models of migration: using demographic models that are consistent with both historical records and genetic data, we find evidence for continuous migration patterns in both Mexican and African-American populations. We also propose models to study the longer-term evolution of the ancestral populations, by considering the allele frequency distribution, pairwise TMRCA's, and a simple extension of the recently introduced Pairwise Sequentially Markovian Coalescent approach for demographic inference. The inferred source population demographic histories are in broad agreement with previous results for European and West-African populations, and the inferred demography for the Native source population closely follows the European one until about 20,000 years ago. Taken together, whole genome sequencing and local ancestry assignment therefore permit inferences about long-term histories of unsampled ancestral populations and highlights recent historical demographic processes that altered patterns of variation observed in admixed populations. Analysis of the genomes of archaic hominins, such as Neandertals and Denisovans, has revealed that these groups have contributed to the genetic variation of modern human populations. Yet, we know little about how these ancient mixtures have shaped the genetic structure of human populations and even less about their impact on human evolution. To answer these questions systematically, we need a map of archaic ancestry i.e., a map that labels whether each region of an individual genome is descended from these archaics. Building such a map is technically challenging because of the antiquity of these gene flow events. We have identified signatures based on patterns of variation at single SNPs as well as haplotypes that are informative of ancient gene flow. 1. We identify around 35,000 Neandertal-derived alleles in Europeans and 21,000 in East Asians. 2. The map allows us to identify Neandertal alleles that have been the target of selection since introgression. We identified over 100 regions in which the frequency of Neandertal ancestry is extremely unlikely under a model of neutral evolution. The highest frequency region on chromosome 4 has a frequency of Neandertal ancestry of about 85% in Europe and overlaps CLOCK, a key gene in Circadian function in mammals. The high frequency, Neandertal-derived variant is specific to Europeans; it is not very common in East Asians. This gene has been found in other selection scans in Eurasian populations, but has never before been linked to Neandertal gene flow. 3. Several of the Neandertal-derived alleles identified in 1) above are found in the >6,000 SNPs associated with common diseases listed in the NHGRI catalog. These Neandertal derived variants are found to be risk variants associated with obesity and protective variants against breast cancer. 4. We also investigate the possibility of using this map to reconstruct the genome of the introgressing Neandertal. Using the ancestries in Europe and East Asia, we can reconstruct about 600 Mb which we expect to increase with larger samples and additional populations. The Etruscan culture is documented in Etruria, Central Italy, from the 7 th to the 1 st century BC. For more than 2,000 years there has been disagreement on the Etruscans’ biological origins, whether local or in Anatolia. Genetic affinities with both Tuscan and Anatolian populations have been reported, but so far all attempts have failed to fit the Etruscans’ and modern populations in the same genealogy. We extracted and typed mitochondrial DNA of 14 individuals buried in two Etruscan necropoleis, analyzing them along with other Etruscan and Medieval samples, and 4,910 contemporary individuals. Comparing ancient and modern diversity with the results of millions of computer simulations, we show that the Etruscans can be considered ancestral, with a high degree of confidence, to the modern inhabitants of two communities, Casentino and Volterra, but not to most contemporary populations dwelling in the former Etruscan homeland. We also estimate that the genetic links between Tuscany and Anatolia date back to at least 5,000 years ago, strongly suggesting that the Etruscan culture developed locally, without a significant contribution of recent Anatolian immigrants. With a few exceptions, most ancient human DNA studies to date have restricted their analysis to the mitochondrial DNA (mtDNA) and Y chromosome. These approaches have led to some interesting theories regarding the spread of human populations; however, they are inherently limited by their use of these two non-recombining markers, which are subject to forces such as genetic drift and natural selection and also represent only the histories of the female and male lines, respectively, from which they descend. Recently, the whole genomes of several ancient individuals have been sequenced. These genomes yielded much more information about the individuals’ ancestry than their mtDNA alone; nevertheless, a single ancient individual is not sufficient for population genetic analyses. Thus, the goal of our study is to sequence the genomes of multiple ancient individuals from the same population. This type of study has the potential to dramatically improve our ability to address demographic questions about ancient human populations. We have begun the low-coverage sequencing of genomic DNA from the teeth of 16 individuals from different time periods (1500 BC-400 BC) in Bulgaria, and we plan to ultimately extend the study to at least 50 ancient Bulgarian individuals from the Neolithic to the Iron Age (6300 BC-400 BC). The results of these initial experiments will be presented, including the identification of mtDNA haplogroups and initial population genetic analyses. Ultimately, we plan to analyze whole-genome sequence variation in these individuals and to compare it to variation present in modern populations. This will be the first systematic population-level study of ancient human genomes and therefore will allow us address demographic questions that have previously been restricted to the realm of theoretical modeling using extant populations. The domestication of horse played a key role in human history. It seems to have happened far both in time and space from the domestication of other ungulates such as cattle, pig, sheep and goat. Archaeological studies, nevertheless, failed in determining exactly the region and modality for horse domestication: several centers have been proposed (at least one in Europe and one in Central Asia) and the relationship between wild and early domestic populations are not clear. From a genetic point of view a phylogenetic approach on modern mitochondrial diversity could not find any structure related with geography or breeds. In the last decade ancient DNA became an important tool to reconstruct past demography. We obtained more than 100 HVR I sequences from pre domestic and domestic specimens found in Europe and Central Asia. After collecting all the previously published ancient and modern comparable sequences from the sub mentioned regions, computer simulations with a Bayesian approach were performed in order to test demographic models related with single or multiple domestications with or without gene flow. A single domestication appears to be unrealistic on the basis of mitochondrial data, while possible model of multiple domestications will be discussed. A draft genome sequence was determined in 2010 from a small finger bone found in Denisova Cave in southern Siberia and was recently completed to 30-fold coverage. Its analysis reveals that it derived from an individual that belonged to a population related to, but distinct from, Neandertals. A large molar has also been described from Denisova Cave and shown to carry an mtDNA genome closely related to that of the finger bone. A second molar was found in Denisova Cave in 2010. We have captured and sequenced the complete mitochondrial genome of this tooth. While the mtDNAs of the finger bone and the first molar differ at only two nucleotide positions, they carry 86 and 84 differences, respectively, to the second molar. Thus, the maximum amount of mtDNA differences observed among these three Denisovans found within one cave is almost twice as large as the maximum differences seen among six Neandertals for which complete mtDNAs are available. Interestingly, the mtDNA of the second molar has a shorter branch than the other two Denisovan mtDNAs, suggesting that it may be older than the others.